Lazy autumn dayz with Richardson Heights. Today I get someone else to do the work for me. Peter Barrickman's "New Work" in currently on view now through the first weekend of November at Centraltrak. We interviewed him about a year ago here. You can view a whole lot more of his paintings here. NOTE: this was posted on 10/22/2009. The twentieth century taught us well that Middle America could indeed be art. Abandoning the premise that fine art only arises in vast urban centers, we are left with scenes that leave the majority of us in comfortable territory. Peter Barrickman reminds us of the familiar in a brightly illuminated suburban world, enhanced by strong, direct color, definitive lines, and a scene or two close to home. Peter Barrickman's collection currently on display in the main gallery at Centraltrak teeters between frenetic clutter and sparseness, all the while maintaining a sense of comedy and Mid-western purity. 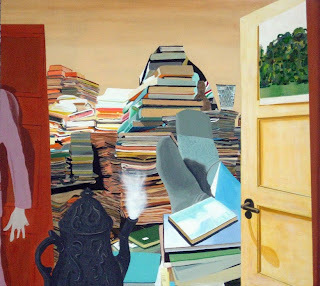 Rather than rejecting the provincial American culture that surrounds him in his home environment, Barrickman's paintings blend odd fabrics and paper cutouts of disparate subject matter with standard painting media to express the variety he observes in the suburban environment outside his studio. Centraltrak's spacious main gallery allows you to absorb much of the plentiful visual information in one round glance. Upon entering, the first trio of paintings centered on the northwest corner subtly transports you from a bright sub-tropical exterior to a cozy winter interior. You are first greeted with a colorful breezy collection of hammocks hanging between trees in a sort of warm out-of-doors in the abstract piece entitled Kosmiter's Zweck. The next piece finds you looking up from below into an ambiguous windowed portal to an interior colored with throw pillow like blobs of color, perhaps a motel in a pastel Miami of recent history, but the title Loom betrays that notion. And then we then find ourselves firmly inside a space: in the very crowded interior of Lodger. Lodger seems to be a companion to the claustrophobic Luggage that was featured in the And/Or Gallery show earlier this year: it employs an illogical use of perspective that makes the far wall of the room feel inches away from the surface of the canvas. Both of the pictured interior spaces act as a crowded archive of dreams, ideas, and possessions – they could be the storage spaces of any residence in America. In Lodger, any apprehension caused by the digitally challenged hand creeping in from the hallway is quelled by the humorously large socked feet basking in the steam of an antique iron teapot. At this point, you feel that you are in sitting back comfortably in an easy chair for an evening of unstructured knowledge assimilation: keeping yourself sane with the ideas printed upon hundreds of thousands of pieces of bound paper somewhere in the middle of Barrickman's America. There is something invitingly strange emanating from this guy's brush. Barrickman, a Milwaukee-born artist with an MFA from Milton Avery in New York, is a former resident of the University of Texas Dallas' Centraltrak. In interviews he displays an unambiguous respect for his hometown and suburbia, he sees childhood dramas as performance art, and he uses technology – contemporary or relatively antiquated – to generate art. It is in fact a feeling of faked digital assemblage that you will find in the next piece, Big Nose, the first in a related series of four large abstract mixed media pieces all now within view as you progress through the room. This piece, along with Borrowing a Rake, Christmas in Data Entry, and the Untitled mixed-media collage, form the non-objective core of the exhibition. They all imitate what is possible in an era inundated and comfortable with Photoshop: precisely juxtaposed and resized sub-images and grids of pixels digitizing various planes parallel with the canvas surface. But this is betrayed by the true manual labor Barrickman employs in these large-scale pieces – edges are intentionally messy, sub-drawings are awkward and oddly arranged with a mix of variety and humor. Borrowing a Rake depicts a ritual – a suburban fall tradition. The air conditioners are no longer necessary and all the neighbors emerge from their respective homes. Once again they need each other and cross the asphalt to borrow their neighbors' yard tools, just like in previous times: the community banding together to bring in the harvest. Barrickman's figures – which are enlarged reproductions of the figures in his smaller drawing entitled Tuesday, also in this exhibition – are obscured by disc-like leaves of various painted fabrics and wallpaper samples falling from sky. A shockingly denuded tree stands dead center in the canvas. A construction-paper chain hangs in the upper left corner. The “leaves” serve also as a pixilated filter; perhaps a filter for what is really going on inside this “television screen.” But presumably these leaves will be collected by the rake and put out with the trash. Around the corner, you find one of the two truly figurative and seemingly straightforward pieces in the show. From afar, it appears to be an igloo village wherein an Eskimo is helping his fallen friend stand up in front of an uncomfortably close horizon. But upon closer inspection, it is simply a green-jacketed Midwesterner helping a fur-coated friend stand up, surrounded by two massive pumpkins. Additionally, the flesh of one of the pumpkins has been penetrated by a seemingly random collection of foreign objects including an apple, invoking Kafkaesque images of Gregor Samsa. Which interpretation is more odd? The title Comrade Cereal Breath does not help much, and we are left with only questions. In the opposite corner is the companion piece that might provide some answers. It is titled Community Theatre and you see from a point of view behind actors on a stage looking out upon an audience, or possibly you are a stage hand looking out through a sea of poorly constructed stage props and background pieces. Blobs of color representing the anonymous audience uncomfortably spill onto the stage reinforcing the sense of “community” in this theater, whether or not you want to experience that community as an actor exposed on the stage. There is a dizzying forward movement in this piece that makes you feel you are being pulled toward the inevitable. After the starkness of Christmas in Data Entry from the series of abstract pieces, you will find yourself warming back up in front of Mura, an intense large canvas that could be a hot corrugated tin roof in the sun shedding light in every direction. This reverts you back out into the exterior that you found upon entering the gallery, and neatly sums up the variety of experience Peter Barrickman's New Work expresses. The suburbs are not so monotonous after all. Image sort of courtesy of Peter Barrickman.